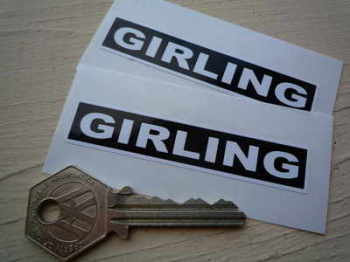 Girling - I Say Ding Dong Shop - Buy Stickers, Decals & Unique Automobilia. Brake System Use Only Castrol/Girling Sticker. 3". Girling Black & White Oblong Stickers. 3" Pair. Girling Blue & Silver Break Style Oblong Stickers. 4" Pair. Girling Disc Brakes Red on White Oblong Stickers. 5" Pair. Girling Disc Brakes White on Red Style Oblong Stickers. 5" Pair. 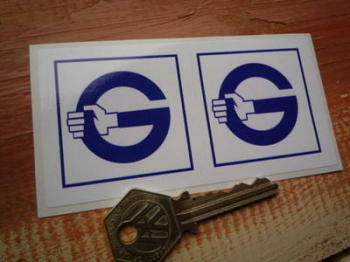 Girling G Blue & White Square Stickers. 2" Pair. 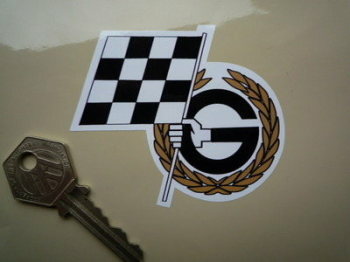 Girling Garland & Chequered Flag Sticker. 3". Girling Gas Shocks Weightlifter Circular Sticker. 4.25". Girling GT40 Style Blue & White Oblong Stickers. 8" Pair. Girling LeMans Style Blue & White Oblong Stickers. 9" Pair. Girling Light Blue & White Oblong Stickers. 9.5" Pair. 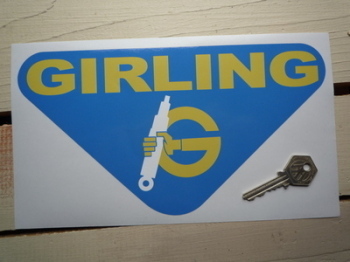 Girling Master Cylinder Sticker. 2". Girling Powerstop 5156 Black & White with Border Sticker. 1.5". 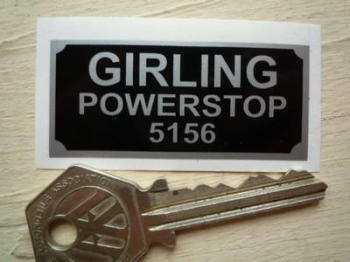 Girling Powerstop 5156 Sticker. 2". 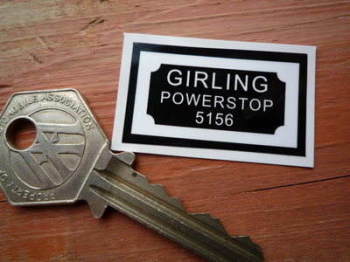 Girling Powerstop 5204 Sticker. 2". 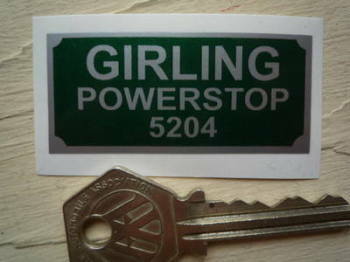 Girling Powerstop 6204 Sticker. 2". Girling Powerstop MK II A 5,5 Sticker. 2". 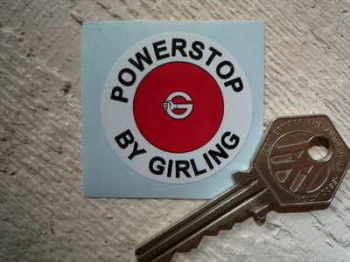 Girling Powerstop MK II B 7 Sticker. 2". Girling Powerstop Servo Sticker. 1.5". Girling Red & White Oblong Stickers. 6" Pair. Girling Red on White Oblong Stickers. 5" Pair. Girling Shock Absorbers Triangular Stickers. 3" or 6" Pair. Girling Small G Stickers. Set of 4. 18mm. Girling Yellow & Blue Break Style 1 Oblong Stickers. 4" or 5" Pair. Girling Yellow & Blue Break Style 2 Oblong Stickers. 4" or 5" Pair. Girling Yellow & Blue Triangular Sticker. 6" or 10". Jaguar Servo Brake System (Colourless to Amber Fluid) Sticker. 4.5". Jaguar Servo Brake System (Green Fluid) Sticker. 4.5".